April | 2016 | The Journal of FA. Micro Origami, Sushi and Insects. That is an insane way to test perseverance and a steady hand. Only in Japan. Dopamine is the motivation chemical. It increases engagement, excitement, creativity and the desire to reach out and make meaning out of the world. This dope chemical accelerates exploration. When crossed anything refreshing and unusual, we get excited and immediate response comes out; that’s dope yaw! That’s similar with Dopamine. When the brain secretes an optimum amount of dopiness, it accelerates pattern recognition (data processing) to able to absorb information faster. Norepinephrine is the organic agent that secreted by the medulla of the adrenal glands to develops attention, neural efficiency and emotional adjustment. This flow agent is tightening focus (data acquisition) and good for productivity. It also referred as the stress hormone. Intense emotions such as fear or anger cause epinephrine to be released into the bloodstream, which causes an increase in heart rate, muscle strength, blood pressure, and glucose metabolism. Endorphin ignites determination. It also opiates relieves pain and produce pleasure, like heroin. The most natural endorphin amount is one hundred times stronger than clinical morphine. Endorphin also evolved during survival. The same chemical switch on-off so we don’t ended up walking on the broken leg. Also promoting wellbeing and emotion; happiness and sadness. Anandamide in the other hand; elevates mood, relieve pain, dilates blood vessels and amplifies our lateral thinking. More critically, it also inhibits our ability to feel fear, facilitates the extinction of long-term fear memories. An optimal body and mind have the right amount of anandamide; makes memory retrieval faster by widens the database search. Serotonin is the safety and respect chemical. This agent accommodating people to cope with adversity. In productivity and intense focus, this element comes later after the flow state. It delivers an after-glow effect and give a feel good sensation after coming to end, and not at the beginning. In a mammal, serotonin is discharged when it recognizes it’s bigger or stronger than another; having the edge creates a sense of security. Oxytocin is the bonding chemical. It promotes trust and sense of belonging. In made in the hypothalamus, of the brain. It has been named as the hug hormone, cuddle chemical, moral molecule, and the bliss hormone due to its effects on behavior, incorporating its character in admiration as well as affection, and has prominent reproductive biological functions in reproduction. 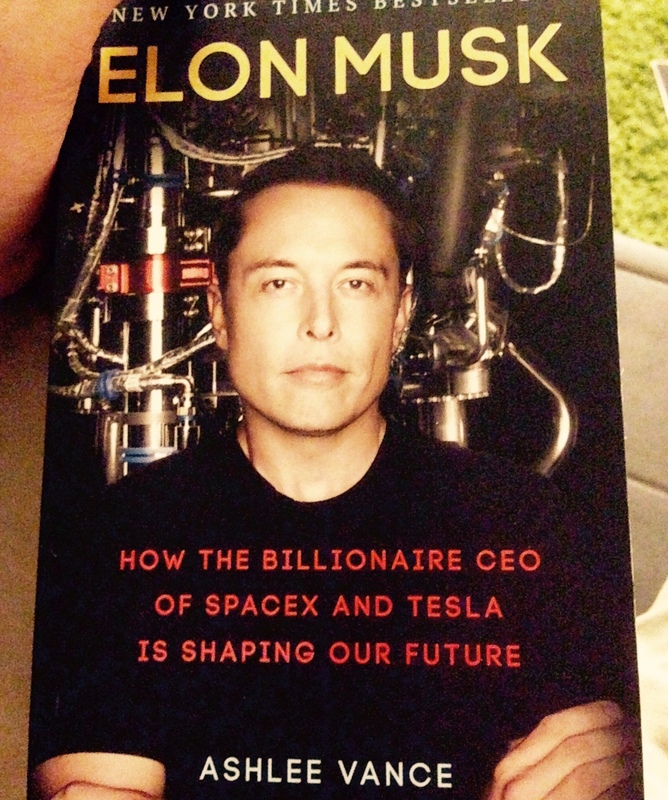 The only reason why I’d drill into this book was because of critics of this biography, not because Elon Musk himself. This biography has in-depth self-centered insights and viewfinder by the author, Ashlee Vance. I kept my prejudice move along as I seek what was not right with the subject. I put the little interest of his back stories since I read/watch plenty of number about Musk somewhere else. Through author’s extensive conversations with Musk himself, his close associates, opponents and others who have personally worked encompassing him, the author constructs a never seen before look at how Musk operates. The theme, however, is lacking authority, it is unlikely to tell what’s genuine and what is merely the author’s opinion. Elon Musk is a highly dedicated entrepreneur. This biography, however, seems will be a backfired by Pro-Musk. It is latter to know from another perspective. I walked out with lesser respect for Musk. However, I keep that hang for awhile and wait for the autobiography of himself. In today modern society, almost everyone talks about ideas. These ideas could be silly or can be great depending on our own personal considerations, but I believe any ideas can be beneficial to one another. In some cases however, not everyone is at the same height as the idea-teller do, hence making the message delivery difficult. Let alone if the idea-teller has lesser schemes/knowledge or the difference point of views on the subject. Also, put aside the story of factuality and realisticity. Far away. I am stressing about the importance how to create a compelling message and get the idea delivered. That’s all. The gist is to put it into perspective to tell the why, what is the takeaway and why we should care. I am talking about the being a character with the ability to deliver what we think that matters out from the mind. Frequently, good ideas come together with the right message, but it unable to go far because the teller fails to put into the right context to the receiver/audience. Compelling story telling is an essential skill. Persuasion is always important – be it in advertising, politics, to succeed in job interviews and other many areas. Like it or not, today careers always fallen into this category. Most of the work requires good skill at selling. This demand affects to many aspects in today society. The bold statement is, everyone should be able to present our ideas effectively. A good message is snap and sticky (graspable). A sticky (great) idea must be simple to understand. A good idea sticks the best when they’re conveyed narratively. Like telling as a story. Einstein once described; how a person only really understood something if he could explain it to his grandmother. A few years ago in America, certain health groups wanted to raise awareness of the fact that movie popcorn – at the time prepared with coconut oil – contained extraordinarily high amounts of saturated fat, making it extremely unhealthy. Simply telling consumers that a bag of popcorn contained 37g of saturated fat proved ineffective – the number was too dry and academic to stick in people’s minds. This vivid message stuck, spread, and eventually led to the replacement of coconut oil with healthier alternatives by all major American cinema chains. What we can learn from the story above, the content delivered are both the same, but it only snapped the right spot when it compelled correctly and reflectable to the audience’s experience. People only will start to pay attention when they care, and that will make it efficient. Let us see what make a message, effective. #1. Short, clear, easy to chew and digest. An effective message means it is simple enough. It is understandable the temptation to explain an idea as thoroughly as possible. But when it comes to stickiness, too much detail can be counterproductive. It’s all okay if we know that the audience has the same degree of complication e.g. presenting at academic conference. But what about to who aren’t? If the message was unable to deliver to that people, we’re done. Rather, strip down what is the matter the most, and keep it in a simple statement. It is easier to understand and grasp the big idea. When delivering a message to masses, it is important to make the message easy as possible regardless any nuances. If it takes long to someone to get the superficial ideas on what you are going telling them; you probably lost their interest. Think about compelling tweets that caught us to click their links. Opera soup performers are a good example at this. Even the show have not started yet, but they have the audience attention by making an opening stunt that gave heart pounding percussions of ‘this is going to be a good show, now pay us attention’. Before performer reveal it’s content (the show), they gave a subtle motion to their audience to give their attention first and pour the mood and theme. #2. Feed curious, surprise and unexpected element. In screenwriting, the plot is always a good tool in what make a good story, buying one’s interest. When delivering a longer idea, always throw provoking curiosity. Surprises making recipient wanted to hear more and stick. Apparently, science told us that our brain turned on unpredictable pleasant things. The brain is love to hear more about the element of struggles, pain and drama more compared when fallen in love. Subconsciously it permits surprised desire experience. Either you agreed or not, these elements are making people wanted to hear more and more. Make them curious enough, and feed with surprises. #3. A compelling message must be credible, snappy real and complete. Be genuine. Good stories are first-hand happenings the teller actually experienced. Yet if it’s a story that’s passed on another after another, an effective presentation still has an element of how that story relates directly to the teller, told in the teller’s own words. The recipe works best with the right amount. Do not over do it. Regardless of the audience size or background, good stories should work for any audience. It is not how many people can hear what we concern, but just that someone, somewhere stick is listening to it. When delivering ideas, always keep the first person perspective in mind, because it will give more credibility and original. Incomplete information often makes it difficult or even impossible for the recipient to carry out an appropriate action. #4. Emotional appeals inspire people to action. Introverts probably struggles compelling idea rightly and that usually make us uncomfortable. Usually, when I able to sold stories, those story usually contain the emotional component. Most of the memorable ones have humour, pain or joy (sometimes all or any combination of three). If every story were simply facts stated, one after another, most of us wouldn’t listen or remember any of it. To stick a story right, knock the spot with emotions to appeals inspire people to action/respond. Concrete – make sure an idea can be grasped and remembered later. Any talks at TED are a good example; of every presentation perhaps buried a higher degree of abstraction or technicalities behind it. But the way it delivers is what makes anyone able to understand the message. So you probably think you think had groundbreaking ideas and billion dollar business ideas (yes I can hear you) that will disrupt this planet badly. You gotta sell that to people with your idea and get it loud. But if you are not convincing or persuasive enough, you will never get the idea sold. Think about this the next time you want to tell someone something (or whether it’s to sell a product/service, make a point or give a speech). If you want people starts to pay attention to you, be good at storytelling. To me, right now – the life does not feel like something that has to be balanced, but rather like a tension that has to be managed. I no longer believe life-work balance. I open-heartedly accept and feel the great pleasure of doing many things. This awakening of life mostly is figuring out how to create the midst of chaos and make it meaningful out of them. Fondness. 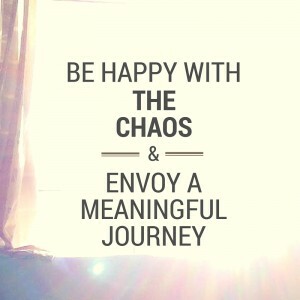 Be happy with the chaos and envoy a journey.